Cornwall is famous for certain types of food. Obviously the one item of food that everyone associates with Cornwall is the Pasty. The Cornish Pasty is essentially a beef pie, with potato, onion, swede(turnip). salt and a lot of pepper in. As far as the origins of the pasty goes, it is believed that the miners used pasties as their packed lunch and the pastry was used to keep the food fresh. In those times, fish instead of beef is more likely to have been in the contents and fruit or jam at the other end is another possibility as a dessert. There are many good bakers in Cornwall who sell home-made pasties in various sizes, but as with most food, we would recommend eating them when they are fresh (most of them are made for lunch times and you often see the locals queue for them in busy times. 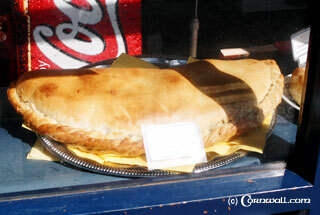 A steak pasty rather than a mince one is more expensive but better for it. In our opinion they do not microwave well, so if you don't have them when they are oven-hot they are better cold rather than warmed in that way. One of the pasty traditions is that if you are lucky enough to have them made for you, quite often they have the initial of the person who they are made for on the top of the pasty. This allows for a specific content (eg no onions / less potatoes etc) for the consumer. The farming land in Cornwall is very suited to Dairy farming and so there is a strong tradition in dairy products such as Milk, Cream, Butter and Cheese. Although today the Cattle breeds are more international than they were in the past, Cornwall boasts a good number of Channel Island herds that give a very high cream content to the milk used for "Gold Top Milk". The major UK dairies have strong connections in Cornwall and Cornish Clotted Cream is arguably the best cream within the UK. It is usually more yellow than the cream found elswhere and is often served as Cornish Cream Teas with Jam and Scones (although bread splits were believed to be more traditional in the area. Likewise Cornish Butter is more yellow than many others. This leads us to Cornish Ice Cream which is an institution. Again the vanilla tends to be more yellow than elsewhere due to the milk and although there are too many firms to mention them all, but we would recommend the small shops where you get the ice cream out of the tin rather than the whipped variety. Among the larger firms we would recommend are Kellys (now available nationwide in supermarkets) and Roskilly's who make excellent ice creams. There are also quality cheeses available with the Davidstow dairy in North Cornwall now being a name known for it's strong mature Cheddar type cheese. Yarg is a new name to most people, but it is a mature quality cheese that is wrapped in nettles. Both of these cheeses are well recommended. Cornwall is also famous for it's fish and seafood. Pilchards used to be the primary fish caught in the area, but now Mackerel, Pollack and others are more common. Lobsters, Crabs and Crayfish are also locally caught. There are a number of excellent restaurants cooking fresh local cooked fish and if you are visiting the area, it would be a shame to miss out on them. If you are on a tight budget and staying in self catering, go to the fishmongers or and ask for something locally caught. if you are staying next to a working cove, the fishermen on small boats will sometimes sell some of their catch when they land if you ask politely. Around Falmouth and Helford River there are good Oyster beds, so look out for fresh Oysters. Saffron Cake is another item to try. It is a sweet(ish) fruit cake with a distinctive yellow colour due to the Saffron. The history of this cake goes back many years and it is believed that saffron was originally traded with the Phoenicians for copper and tin in the Roman times. Another cake is Hevva Cake or occasional referred to as Heavy cake which again is a fruit cake, but it is whiter, flatter and more solid than Saffron cake. This was probably suitable as a treat that the fishermen could take with them on their long trips at sea. Other goodies include Cornish Gingerbreads or Cornish Fairings biscuits which are a strong tasting Ginger biscuit with a rough surface, the former sometimes having lemon peel in. Last but by no means least is Cornish fudge that again is special due to the quality of the local cream and is available at many good shops. Like many other places Cornwall has international style restaurants and it is not uncommon to see Chinese, Indian or Italian restaurants, but we would definitely recommend trying the locally produced fish, beef and vegetables. As far as drinks are concerned, although Cornwall has a Cider sometimes spelt Cyder reputation, there are not as many orchards there as you might think, but you could always go to have a look at one such as the Cornish Cyder Farm. Just in case you are not sure what Cider is, it is an alcoholic drink made from fermented apples. Fine Ales /Beers are also brewed locally with the best known St Austell Brewery being open as an attraction. Cornwall now has a vineyard Camel Valley Vineyard and so locally produced wine is now an option. The other alcoholic drink that must be mentioned is Cornish Mead which is a fermented drink made from Honey with some restaurants being known by the word Meadery if they serve it.